The Peel car company is the one and only car to be built commercially in the Isle of Man (in the British Isles). 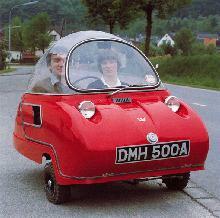 Peel is best known for producing its small bubble cars Trident Mini sports coupe. The last Peel cars were built in 1967.